I have gone through boxes in the garage that would have remained dormant for eternity. Well, then why was I storing it? My old teaching boxes, various boxes with old memories I NOW had the confidence and desire to go through because of her words. She builds you up with reason on how to approach what you own. Most of what I found I could donate, some things I could bring out that my kids could use now. Maria gobbled up my old teaching books and has been using them for lessons–the sweetest thing. Our garage now more reflects our current lifestyle, housing what we use; surfboards and bikes, it no longer feels overwhelming. 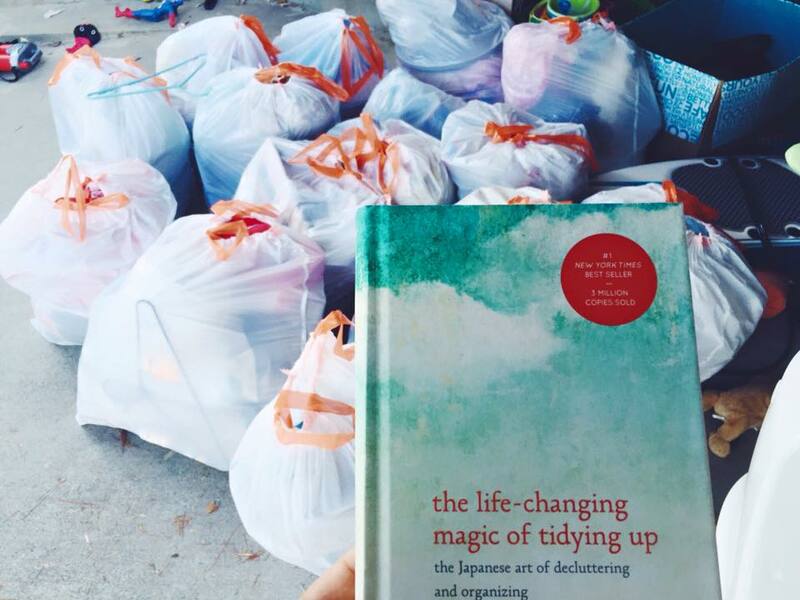 I donated all the excess to our friend’s adoption garage sale, and when I transferred it to her car, I looked at how silly and dusty the items actually were. They really had just been holding me down, and there wasn’t much special to it. This weekend we went out of town, and it was one of the first times packing that wasn’t extremely hectic, it was calm and easy. I knew where the right suitcases where, I had gotten rid of the ones we never enjoyed. Any clothes I picked were all good options and well suited to me and I don’t have excess in the closet any longer, I didn’t need to dig around for things. Our travel toiletries weren’t overwhelming, we have actually been getting rid or using up most of them while at home, so it was easy to manage. Honestly, it was an amazing experience packing since using her methods–a real first for me. We have much more time for extended play with our children and not constantly trying to manage stuff. Life feels freer yet fuller, more peaceful. But what’s interesting is that I would have considered myself a minimalist prior to reading this book, yet I still had excess weighing me down that I wasn’t aware of. Or I thought it would be wasteful to get rid of certain items, when I now know that’s just silly. If you are a hoarder, and are nervous just at the thought, don’t worry, no one is going to force you to do anything. You will still really enjoy the book, and it will be a great education for anyone and you can choose what to do with it as you read. I have this book on hold at the library and I can’t wait to get it and read it! I’m reading this book too. I pretty much wanted to get started on the tidying after the first chapter! My husband and I are pretty tidy people but we still keep SO much stuff that we “maybe will use someday” or that we “kinda mostly like.” I can’t wait to get started on the purging!! Yes! I listened to the audible version of the book. It’s so obvious & logical, yet, I didn’t do it until I heard the book. Raising your kids will be MUCH easier with this philosophy. I wish I had it when mine we’re young, I think of all the headaches I could have saved. Love to your beautiful family.